Корнуолл – Апартаменты в Корнуолл. Карты для Корнуолл, Отзывы и Фотографии для каждого Апартамента Корнуолл. Ищете хостел, недорогую гостиницу, квартиру, комнату, ночлег и завтрак, пансион или гостевой дом - Корнуолл? Нет необходимости искать дальше, все лучшие предложения - Корнуолл на ru.Dorms.com. Как и тысячи людей каждый месяц, зарезервируйте ваше проживание в хостеле заранее, безопасно и по самой выгодной цене во всех районах Корнуолл: в центре города, модных и студенческих районах, недалеко от автобусной станции, метро, железнодорожной станции, аэропорта или недалеко от всех достопримечательностей - Корнуолл. You can also find the time to explore eleven different beaches and the many legendary surf breaks around this beautiful coastline. Then there's the historic county beyond the dunes - discover the mythic ruins of King Arthur's castle at Tintagel, Penzance and St. Michael's Mount, the famous Minack Theatre, Land's End and the exquisite Porthcurno and Kynance Cove. Room was nice and clean with comfy beds. The hostel is in an awesome location - woke up to a lovely view of the beach! There was also a pretty great breakfast selection for a hostel. Amazing location and great vibe for a party. Probably not the best for a quiet weekend away but was perfect for a boozy one with friends. The hospitality was excellent with customer service!!! Highly recommend it!! This is one of the best hostels I have stayed in! The staff and location were absolutely perfect and everyone was very welcoming. The rooms are really clean and we had an awesome view of the sea. I will always recommend this hostel to anyone staying in Newquay! 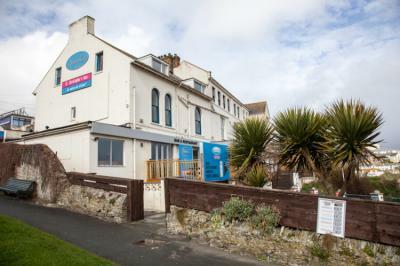 The Hostel is very well located with a very beatiful view of Newquay Bay.